Lots of interesting stuff going on there. Notice, in particular, how the trust in science falls off a cliff for moderates in the 70s. 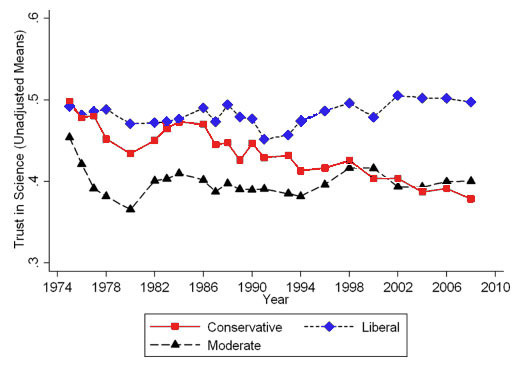 It’s also fascinating that conservative trust in science used to be as high (if not higher) than that of liberals 40 years ago. This is still the case in Europe — for the most part there is no liberal/conservative divide in trust in science. Less-educated conservatives didn’t change their attitudes about science in recent decades. It is better-educated conservatives who have done so, the paper says.